Now that Boston’s out, I can finally write subjectively about the NBA. I couldn’t care less who wins these finals. If OKC wins, then it’s the start of what could be a long dynasty in the making. If Miami wins, Lebron gets redemption and IT could be the start of their dynasty. Whoever wins, one thing’s for sure, with the ouster of the “older” teams of San antonio and Boston, the future is here, in the NBA. By the way before this series started, my prediction was OKC in 7. Not because I’m a heat hater (die Lebron, die) but because I think they simply have more weapons one through 9 than the heat. They’re deeper, longer, younger, and also they don’t have to contend with the same pressure that Lebron and the rest of the Heat have to. Not many really thought this was going to be their year, if ever, it was going to be next year. But to their credit, they’ve just been unfazed with their competition and it seems that they have the same attitude going into this series. 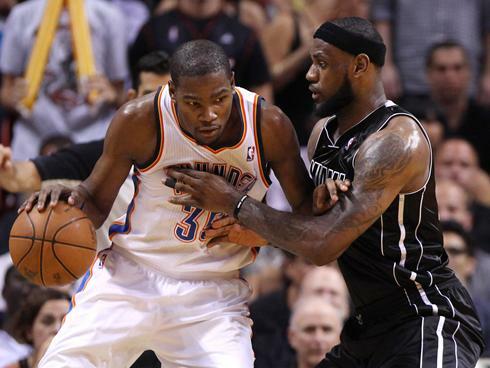 Now going into game 2, a friend of mine believes that this is more crucial for OKC than Miami, and I have to agree. Winning game 2 at least guarantees a return trip to OKC where they have been untouchable. Expect the heat to come out strong later and try to sneak in a win before going back to south beach. Can they do it? Here are 3 questions that could be the difference in the game. 1. Will the real Dwayne Wade please stand up? 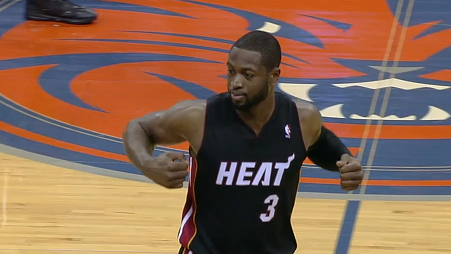 For Miami to win, they need flash. Wade has been less than stellar this playoffs averaging a silent 22ppg and around 5 boards and assists a game. This can be because Lebron has just been absolutely phenomenal and this was a question I asked from day 1 of this Miami experiment. Can they co-exist? Surely someone has to step down, and clearly, Wade has done just that. But for Miami to win it all, they have to get the old flash back. he went 7 for 19 in game one to get his 19 points and that’s just not gonna get it done. Miami doesn’t need a flash back to 2006, he just has to be more effective as the second option of this team. And even though he says it’s Lebron’s team this year, clearly a better wade will be tough for OKC. 2. Which team will continue making it’s jump shots? The always entertaining Jeff Van Gundy said it best, this is a make or miss league. To make it simpler, if you make your shots, you will win basketball games. It’s what caught boston on the fourth of game 7 (asdfasgadfvasdg) and it’s what got OKC back in the game and the heat down on game 1. Shane Battier and Mario Chalmers were stellar to start game 1 hitting his threes and this opens up the court for LBJ and Wade to penetrate. However, it was a different story. OKC started making shots with Westbrook hitting that transition mid range shot and Durant being, well, Durant, hitting it from all angles. Derek Fisher also hit some timely shots in the first half to keep them in the game. Can Miami’s role players and 3 point shooters provide the space for LBJ and Wade to operate? And Miami did a good job defending james Harden, but what happens when he starts getting and hitting his shots which is really bound to happen? It seems logical and really simple but who can put the ball in the basket normally wins games. 3. Will Lebron have anything left in the tank? Lebron has been marvelous these playoffs. I kid about how he isn’t clutch along with almost everybody else but really, he has been stellar these playoffs in crucial moments. His game 6 performance in Boston will go down as one of the best ever. 19-26 for 45 points? Now that’s efficiency. He singlehandedly saved the season for the heat that day and he’s the main reason why they’re in the Finals. But can he sustain this remarkable run? He’s averaging almost 43 minutes a game these playoffs and I’m pretty sure that number will go up before all this is said and done. Don’t get me wrong he’s a beast athletically and hos motor is stronger that a 10 wheeler but will he have enough in games to finish OKC off in the 4th. In game 1, it didn’t look like it. It seemed that durant was fresher even if they’re almost identical in minutes. It’s been mentioned a thousand times but the amount of pressure that Lebron gets is just unheard of. He’s just so easy to hate on, from the way he handled everything in cleveland to the stupid pre-season celebration the 3 of them had. His every move is under the microscope. And not a person alive can say that won’t affect them. Last time I checked, Lebron IS human. If it seems that it’s looking like a lot of things have to go right for Miami, it really is. And if OKC pulls this one out, they won’t be only starting their dynasty, they might kill the Heat’s before it even begins. The NBA Finals are rigged? The officating in game two was the worst i have ever seen. To have veterans official calling the it was very bad. The NBA have fell in a large trap with Las Vegas gambling, so who ditate the out come? The thing that get’s me that a foul is a foul no matter who gives it, whether it’s veteran or rookie you must make the call ,if not you are not doing your job. To not call a foul on james was unheard of. That was the last nba game I will watch. I will not support this non sense.To have a no call at the end of the game when everybody that was watching know that it was a foul is mine boggling.The nba think it’s larger than the fans it’s very sad to let things like this happen every year, who’s paying who?Why would you the(nba) want a series to go to the end when one team is much better than the other one? Who need the money not the players and their families, not the network so who need the money? Oh i know who need the money now the officials that’s who? Everybody get in a room have a meeting discussing which team is going to win which game and who too call fouls on and not too call fouls on. Game two(2) will stick with me for a long time, there is no makeup call that one.The comiss should be embarrassed about everything that’s taken placed if he really care. What about the small person? Oh they don’t matter. The money is more important the root of all evil sleep well!!! !